It's not your father's grill anymore. For the Ultimate in Outdoor Kitchens turn to a company that's been in the kitchen business since 1978 and has built a reputation for quality products and services. Now, if you are looking for the ultimate in outdoor kitchens you are only limited to your imagination and your budget. S & W Kitchens can create whatever you're dreaming of for an outdoor kitchen and can work with any budget big or small. S & W Kitchens is recognized as one of the leading experts in outdoor kitchen designs. 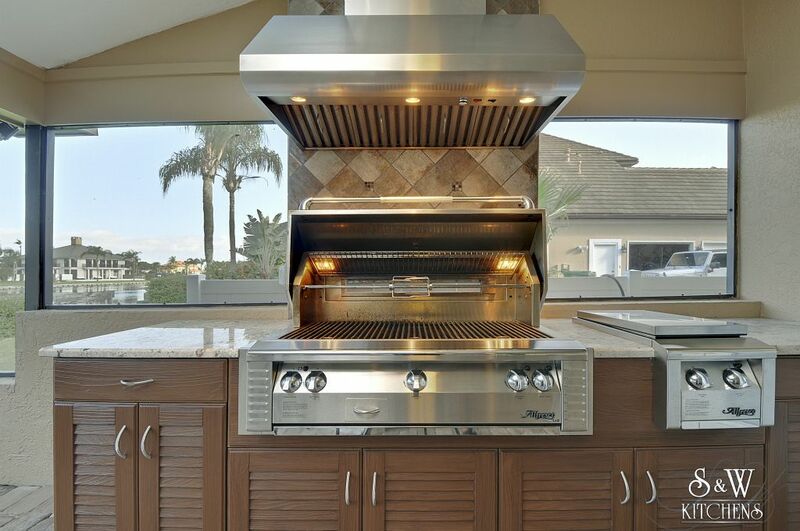 We offer a full spectrum of custom outdoor kitchen packages to accommodate our client’s lifestyle and budget. Using only the highest quality materials and construction methods, S & W Kitchens' products deliver a complete, all-season outdoor cooking environment that is naturally durable, functional and beautiful. It's all you need to transform your backyard into a year-round living space for food, family and fun. The National Association of Home Builders estimates that outdoor kitchens, also known as summer kitchens, can add as much 130% of their cost to the purchase price. If you've never considered an outdoor kitchen, after you own a home with an outdoor kitchen, you may wonder how you ever got along without an outdoor kitchen in the past. Cooking outside keeps the heat out of your home, which should reduce your utility bills. It reduces the need to run back and forth to the home since everything you need is in one place. Outdoor kitchens offer the opportunity to cook while being surrounded by family and friends. It's a great way to socialize and not feel ostracized inside while everybody else is outdoors enjoying the weather. The house stays clean. Typically clean-ups outdoors are simple and fuss-free, just sweep or wash off the patio and decking afterward. Outdoor kitchens are fun. It's enjoyable to be outdoors, to relax in a lounge chair, perhaps to watch somebody else do the cooking. Some foods just taste better cooked outdoors. Whether it's a lobster and clam bake or a plain hamburger, nothing really beats a grill for flavor.